Last week, I was asked to take part in an “Extreme Unboxing” video campaign for smartphone giant Samsung. For this, I travelled to the headquarters of Ultimate High, the British Centre of Aerobatics Excellence, based in Gloucestershire (in the UK), to demonstrate and talk about Samsung’s new Galaxy S II smartphone on camera. Filming the unboxing wouldn’t have been a problem, but it was to be recorded as I was being thrown about at 8,000 feet, being turned upside down, flipped in the air and introduced to forces of 7G at some points during my flight. I did pretty well, until the end – my body couldn’t take any more. 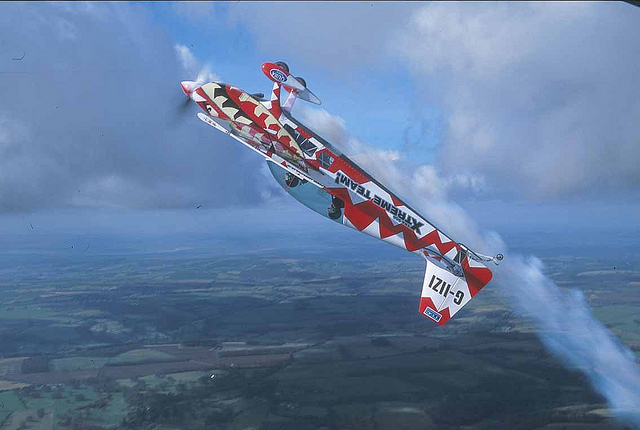 I can safely say that doing anything at 8,000 in an acrobatic aircraft would be difficult, let alone unboxing a device. The Samsung Galaxy S II is a pretty slick phone, slicker now I have managed to vomit on it. Look out for our full review, coming soon.